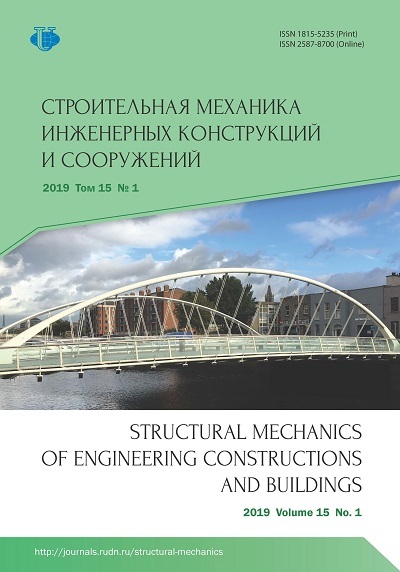 The review-and-analytical and scientific-and-technical Journal «Structural Mechanics of Engineering Constructions and Buildings» acquaints the readers with the recent achievements of scientists, researchers, and engineers of the Russia and other counties. “Analysis and design of building structures”, “Dynamics of structures and buildings”, “Analytical and numerical methods of analysis of structures”, “Shell theory”, “Problems of theory of elasticity”, “Buckling analysis”, “ Geometrical investigations of middle surfaces of shells”, “Experimental researches”, “Theory of plasticity” , “Mechanics of liquids”, and “Strength of flying apparatus” are the main parts of the Journal that define the modern standards of scientific researches on building, machine-building, and architecture of space large-span structures. The Journal is ready to widen the scope if it will receive original and topical contents. Since the first January, 2007, the Journal has been included into the “List of leading peer-reviewed scientific journals” released by the Highest Attestation Commission of the Ministry of Education and Science of Russia (HAK). The results of PhD and DSc dissertations and fundamental scientific researches must be published in the journals from this “List”. 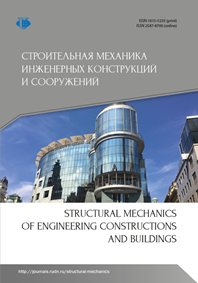 The new “List of the Journals” approved by the Ministry of Education and Science of Russia at 12.01.2015 also contains the Journal «Structural Mechanics of Engineering Constructions and Buildings». Every issue of the Journal is sent to Russian State Library, as well as to other leading libraries, universities, educational and research institutions of the Russian Federation.